The Moab Easter Jeep Safari is less than two months away, and my $800 Jeep Grand Wagoneer, Project Redwood, is still in shambles. But I’m not as worried as I was, because I made a lot of progress last week. Normally, my off-road project updates consist of me declaring that the sky is falling, and that there’s no way in hell I’m going to finish the build on time. But not this time, because there’s good news: I actually think there’s a chance that I’m not doomed. That’s because, thanks to my friend Taylor, I’ve now got the Jeep in my garage, where it’s marginally warmer than it is in the Michigan hellscape outside these walls. 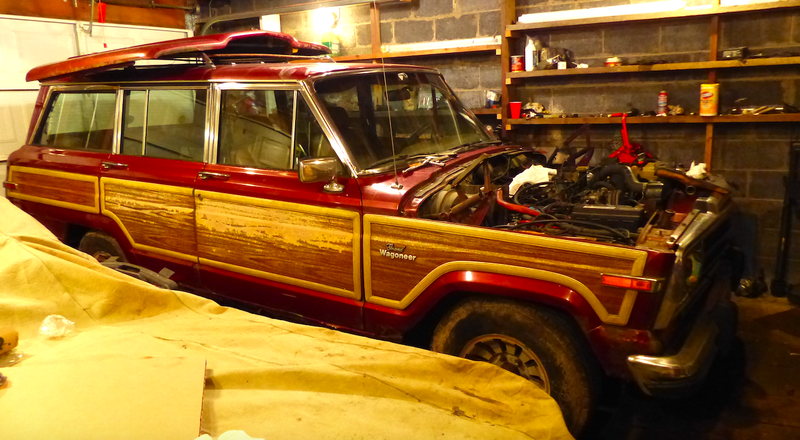 Getting the 4,500 pound Woodie into that space was no easy task, because the rear brake is seized, and the transmission doesn’t seem to go into drive (or if it does, the engine just isn’t able to overcome that locked rear drum). Luckily, Taylor came over with these amazing Harbor Freight “Go-Jack” devices (see above), which basically lift the vehicle on casters, allowing one strong man and one weak man to push the Jeep around the driveway. If we’re honest, we had a bit of trouble shoving the Jeep all the way down my driveway and into the garage (a “Go-Jack” slid off the driveway and into the grass, and we were stuck), so we took off the shoes and enlisted the help my trusty $600 XJ, Project Swiss Cheese. After hooking up a tow strap, we yanked the Grand Wagoneer (the seized drum was no match for my XJ’s torquey four-liter) as close to the garage as we could, and then slapped the shoes back on. We spun the Woodie 90 degrees, and simply pushed it into the space. And, to my surprise, the thing fit great! There’s plenty of wrenching space left over, which was not the case with my other SJ-platform Jeep, my J10 pickup. In any case, rebuilding these brakes will be easy and cheap. And hopefully, if I pray to the Jeep gods enough, the vehicle will actually, you know, move under its own power. (I’m still a bit worried about the transmission). Just look at how much space that opens up for wrenching. I can finally get to those rear spark plugs without bruising my ribs on the hood! While we were gazing at the glorious AMC 360 engine, Taylor and I decided to yank off the Exhaust Gas Recirculation Valve, which we’d noticed was bouncing all over the place when the engine was running. Something about it seemed a bit...off. And indeed, things were “off.” Namely, the three screws holding the valve to the bracket—they were broken, and the EGR valve was dumping tons of exhaust right into the intake. Anyway, I may or may not have an EGR block-off plate coming in to solve this issue. Will the Jeep emit a few more emissions without an actual valve? Who knows. But it should finally idle. And at that point, I should be able to take the Jeep on its first voyage in 12 years. This is where the Jeep sat two weeks ago. It was cold, and my wrenching speed took a major hit. I’m not promising I’ll finish this project on time, but things are looking up. At least, for now. Once I get the Jeep on the street, who knows what weird problems I’ll run into. What Are The Worst Conditions In Which You&apos;ve Ever Had To Fix A Car?